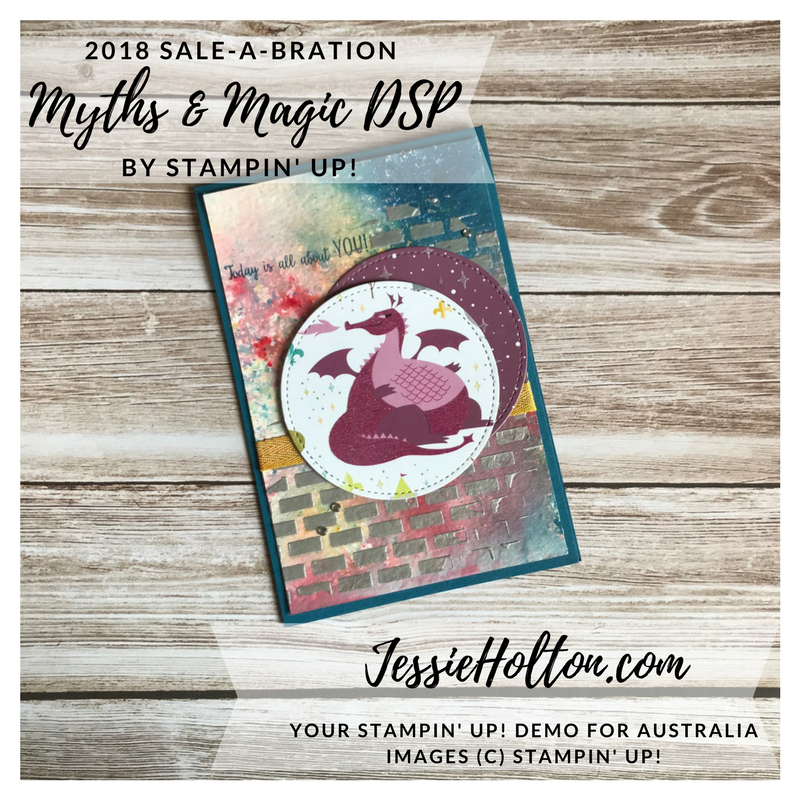 Today I have the second installment of some cards I've made with the Myths & Magic Designer Series Paper. 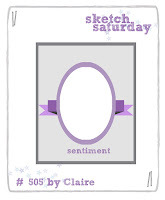 This paper is still available to purchase but is now also available as a FREEBIE under the Sale-A-Bration items! Exciting! This gorgeous paper has glitter all the way through it! The second card I'll show you is another card I made for Luke's birthday, for my in-laws to give him. See yesterday's post for my Bermuda Bay Dragon variation of this card. This Rich Razzelberry dragon reminds me of Jabba the Hutt haha! This background is part of the Brusho backgrounds I made a month or so ago. I like to make them in bulk as they can take a little while to dry naturally (or you can use a Heat Tool to speed up the process). I have used a mix of all the Brusho colours to make these. Then I have smeared the Silver Embossing Paste over the top using the brick embossing mask from the Party Patterns Decorative Masks. I have stamped the sentiment in Dapper Denim using the Epic Celebration stamp set - this is another free Sale-A-Bration product. I've also used a Dapper Denim cardstock base. 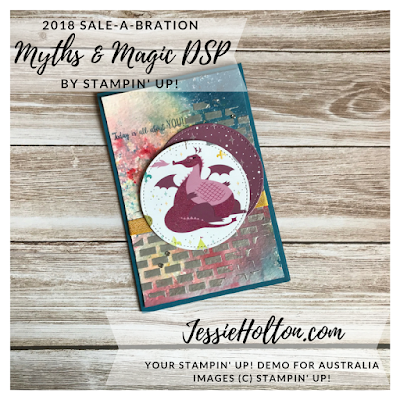 The dragon & stars paper have been cut with the largest circle from the Stitched Shapes Dies. There is a strip of Crushed Curry Chevron Ribbon behind & a few Basic Rhinestones. 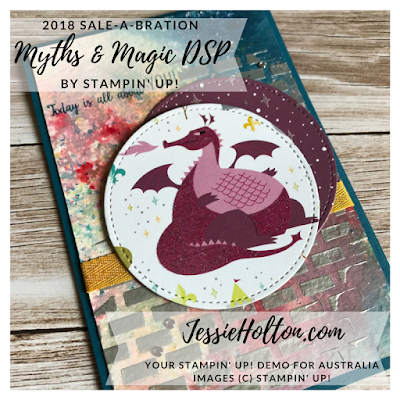 I have stamped the inside with the Number of Years stamp set in Dapper Denim & fussy cut the castle & knight image in coordinating colours to my dragon on the front. And here are some of the products I have used in today's cards. Click the image to go to my online shop. 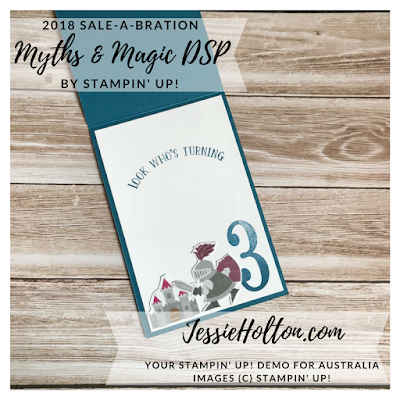 Remember to use my monthly hostess code to go in my monthly customer draw & shop in $90 increments to get your Sale-A-Bration freebies!